The mashed potatoes were starting to stiffen in the bowl. “I beg your pardon,” their mother said. “Your cooking excepted, Mom,” he said and they all laughed. The girl dropped her fork to the floor. Angela got her a clean one and sat back down. They felt the strength of winter in the blackness outside, and unconsciously moved their chairs closer to the table. They looked dutifully toward the end of the table, where the old man sat. He straightened up, patted the front pocket of his flannel shirt, and painstakingly removed five small pills, lining each of them on the table's edge before washing them down, one by one, with an equal measure of water and effort. They let out a collective breath when he slumped back in the chair, exhausted. 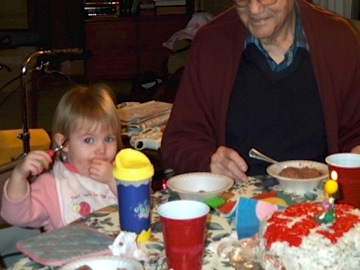 “Everything okay, Grandpa?” Angela said, noting the barely touched food on his plate. After a minute, Nathan cleared his throat. Their mother put down her fork. “Heavens. Is this any kind of talk for the new year?" “Right,” Nathan said, catching his sister's eye, who smiled behind her napkin. “Because luck's just a big ol' helping of metaphysical roughage." "Well, I don't care to understand it. Why the two of you have to look down on simple things . . . simple people--"
The sparring devolved into bickering. Nobody noticed the old man catch the little girl’s eye and hold it for a good, long moment. He took up his fork in his left hand and pinned the side of pork to his plate. Then, sawing with his right hand, he forced the knife through the meat until a piece broke free. He put down the knife, switched the fork from his left hand to his right and lifted the meat to his mouth, holding it there for a good, long moment. He looked at her and nodded. She seized her silverware, looking at the individual pieces before her. A spoon clattered to the table. She gripped the fork in her left hand and stabbed the hunk of meat. Then, with her right fist held tight about the handle, she moved her knife bit by painful bit until a chunk of flesh ripped free. She looked up in surprise and found the old man’s eye trained squarely on her. He took the meat in his mouth and began to chew. The girl sat a little straighter in her chair and began to chew, too. “Fine, fine,” he murmured to her, beneath the din. She and the old man ate in silence, her legs swinging freely beneath the table. And when she smiled at him, a little bit of meat stuck through the gap in her mouth where a new tooth was just coming in. For my Granddad, whose absence is felt at every family gathering.